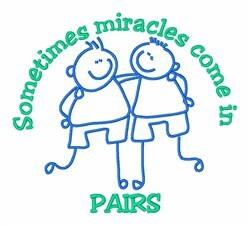 Experience PAIR-adise and count your blessings two by two with this design on bodysuits, layettes, diaper covers, baby t-shirts, hats, bibs & more! Satin Stitch is happy to present Twin Brothers Boys machine embroidery design which has 9444 stitches and is [125.46 mm x 113.07 mm] large. If you would like to view more embroidery patterns please search on our embroidery designs page.